"Known as the iron rug of Persia, the typical Bidjar carpet features strong construction, formal designs and a coarse, durable texture. In terms of style, these rugs fall somewhere between rustic village rugs and elegant city carpets. A classic Bidjar rug can include a diverse range of designs. However, the unifying themes in every Bidjar rug are the handsome colors and reserved patterns that contribute to their traditional designation as a man’s carpet. 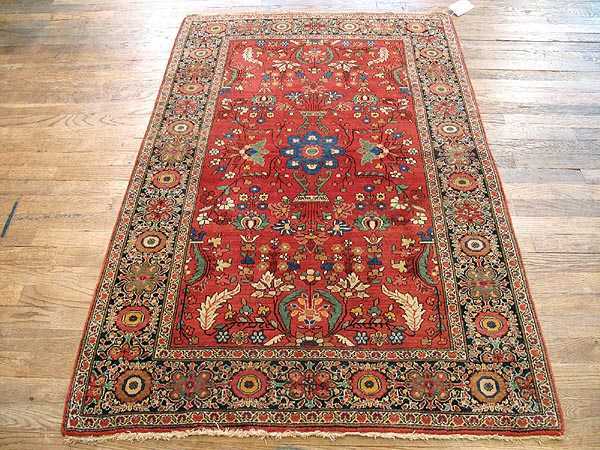 A fine Bidjar carpet such as Halvai Bidjars will often feature angular vinescrolls, all over Mahi patterns and hexagonal medallions that utilize a color palette based around warm reds, dark backgrounds and earth-tone accents. fatsohouse"